A number of business transactions can be carried out through SAP CRM that makes it possible to complete basic activities easily and quickly. Some of the commonly used business transactions in SAP CRM include – Quotation, Opportunity, Lead, Contract, Order, Complaint, Service Contract, and Service Request. What this means for a company is that they get all the functions and a proper business structure that they can use to their efficiency. In other words, business transactions in SAP CRM enable your organization to carry out business interaction with business partners effectively.At the end of this tutorial ,you can refer the transaction codes used with Business Transactions module. The same interface can be used over and again. In other words, certain processing concepts are the same across different business processes. Different items from different business contexts can be included in one transaction. You can include different components of business transactions regularly. It does not matter which business transaction you want to carry out through SAP CRM; the look and feel of all business transactions remain identical. Irrespective of the business processes of your company; it is possible to manage and control them effectively and easily through business transactions in SAP CRM. Getting to basic settings of business transactions is easy. All you need to do is select SPRO path and then click ‘Transactions’ under ‘Customer Relationship Management’. 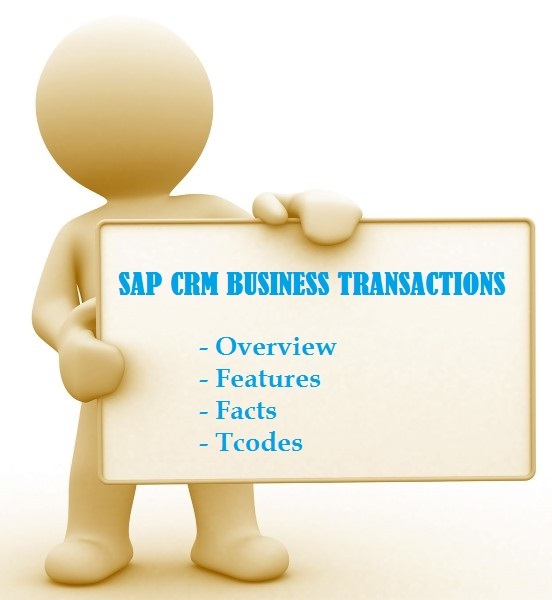 Among many things, you will find in SAP CRM Business Transaction is a leading business transaction category. Depending on the leading business transaction category, the structure of CRM business transaction will take an appropriate shape. Typically, the CRM business transaction will comprise of header levels and item levels. While the header level will comprise of general data such as description, pricing procedure, priority, subject, sales cycles, etc; the item levels will include item-specific data such as billing relevance, pricing relevance, resource planning relevance, ATP relevance, etc. As the name suggests, a Follow up transaction refers to the current business processes’ next business transaction. For example, Sales Orders can be created from a released Sales Contract. In this case, the follow-up document is the Sales Order. It is also possible to copy a business transaction to create another for the same type of business transaction. For example, you can copy a sales order to create another sales order and so on. A follow up transaction can also be either created or copied from an existing business transaction. Whenever a business transaction is copied – transaction history will not be updated, transaction type is same, item data and the header is same, and details of source transaction will not be maintained. Whenever a follow up transaction is created through a transaction – header data is copied, transaction history is updated, you’ll have the option of selecting items, you can even have the transaction type copied for the follow-up transaction etc.